I’m a TLC show junkie. It’s my guilty pleasure. Nothing’s better than sitting down on the couch after a long day, hitting my TiVo button, and seeing Sister Wives, Cake Boss, Hoarders, or Say Yes to the Dress just waiting for me to watch. Dan makes fun of me for this constantly. A few months back, Extreme Couponing caught my eye. Inspired by it, I decided to get a little more into couponing myself. I’ve done fairly well, so when asked by friends at book club last week how I did it, I thought I’d share my secrets. As you can probably tell, I’ve always been one to look for a deal. If I buy something online, I’m checking for a promo code. If I know I need something from Macy’s, Carson’s, Michael’s, JoAnn Fabrics, Express, Bath & Body Works or any other retailer that regularly sends out coupons, I will wait until I have a coupon in hand to make my purchase. It’s a small way to save money, but it adds up. You saw how much these coupons helped with all my DIY wedding-related crafts. As much as I loved deals, I never took coupons to the grocery store. I didn’t give it much thought because the coupons in the Sunday paper are always for such a small amount, like $.50, and the items the coupons were for were not usually items I needed right then. Plus, if I just bought the store brand instead of the name brand, I was saving at least as much as the coupon, sometimes more. It didn’t seem worth the time or effort. One thing Extreme Couponing taught me is that the way to save money with those coupons is to use those coupons on an item that is already on sale. I can’t believe I never thought of that. This way, you’re getting two discounts on the same item. Add in a store-specific coupon (if you have one), and you’re really saving big. The other day, I went to Walgreens for Gillette body wash for Dan. The Walgreens weekly ad had a coupon that made the body wash only $2.99, down from the regular price of $4.59. Added to that, I had a $2 off 1 coupon for the body wash, which I had gotten in the Red Plum coupon newspaper insert from a Sunday paper about a month ago and kept in case I needed it. I paid $0.99 for an item that was regularly $4.59. I ended up saving $3.60, or 78%! I also saw that on Extreme Couponing that at check out, the coupons were doubled, which is how people were able to buy cartfuls of groceries with 90% savings. I did some research to see if any stores in the greater Chicagoland area doubled coupon values. Nope. Bummer. 1. Target’s website has a coupon section. Just click which ones you want and they will print out. Remember to use these with regular manufacturer’s coupons for even more savings! 2. I visit the Redplum coupon site. They don’t have as many coupons listed to print as their coupon book in the Sunday paper has. 3. I go to coupons.com. They have different coupons based on different zip codes. I don’t usually enter a different zip code unless I know of a coupon I want. 4. I just became a Chicago Tribune Sunday newspaper subscriber. I have a 6 month Sunday subscription that I bought for only $13 with coupon code X277. That promo code may not work since it was from a little while back. If not, visit Retail Me Not and find a new one. I figure if I use just one $.50 coupon per week, we’ll have broken even. And we now have the funnies to read with our breakfast. It’s a win. Once I clipped about 2 weeks worth of coupons, my coupon stack became unwieldy. Something needed to be done about them, to organize them in some way. Of course, these categories work best for me. You need to figure out what works best for you, as this list is by no means exhaustive. After I clip my Sunday coupons, I put them into the binder by category. This way, when I see Jewel has a sale on Lean Cuisines, I can easily flip to the Frozen Food tab of my binder to see if I have a coupon that would make the Lean Cuisines even cheaper. This system has worked very well for me. 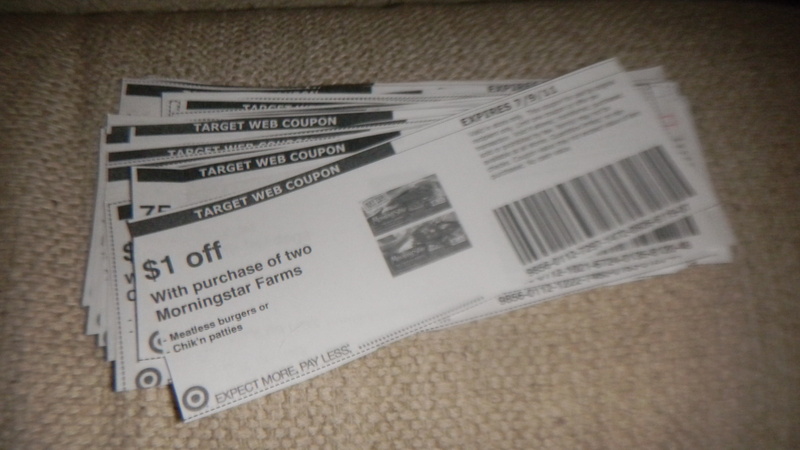 I did recently add a new tab to the end of my binder for Target-specific coupons since I was printing quite a few of them and preferred to keep them separated from the rest so I would only see them when I wanted to have Target only ones. 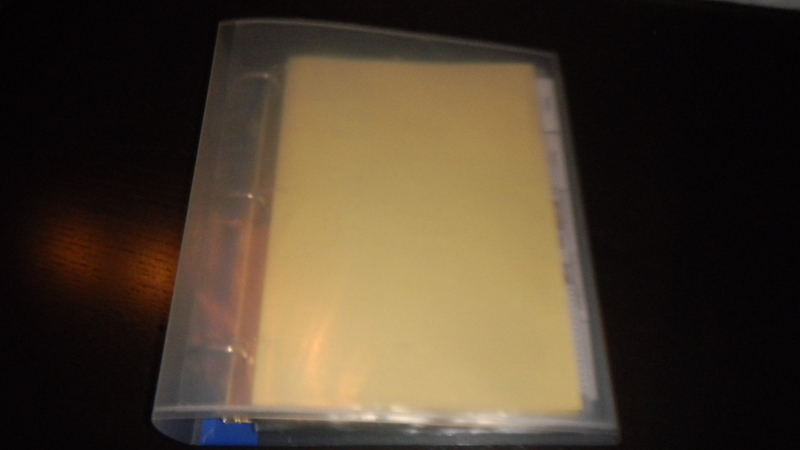 I create my weekly shopping lists from looking at the store ad and comparing the items on sale with the coupons I have in my binder. I try to stay organized as much as possible by separating the coupons I plan to use that week by store. I have an envelope for each store and put the coupons in the correct envelope. 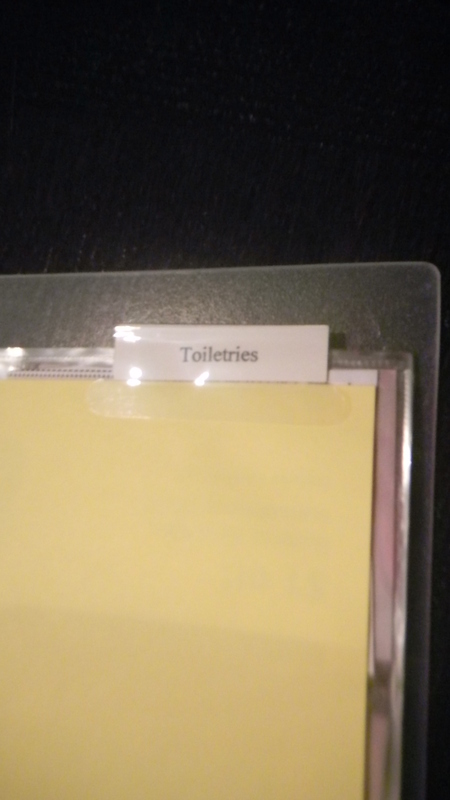 I write out my shopping list for each store on a sticky note, and stick the note to the store’s envelope. This helps me be as quick as possible, and it also eliminates distractions and excess purchase of items I don’t need that aren’t on the list. Just in case I do see an item on sale on some item that I didn’t know about, I try to bring my binder with me on every trip to the store. That way, I can easily grab a coupon if I need it, without having to come back to the store later. A quick tip: the best in-store, not planned deals on items already on clearance that I can match with a coupon. For example, sometimes Target has some of their toiletries on clearance. If I happen have a Target coupon or a manufacturer’s coupon for that item, I save big. These sites will let you know the price of an item at the store, if there are any store coupons or manufacturer’s coupons, and what the final price will be. For those newbies, Krazy Coupon Lady has icons she puts next to the good and really good deals to let you know to stock up. 2. If you are couponing, you can’t be brand loyal. You have to go with what’s the best deal. I’m not picky about a lot of items like body wash, shampoo, conditioner, mouthwash, toothpaste, salad dressing, chips, laundry detergent, and a whole bunch of other items. Of course, there are some products I just won’t switch, like my deodorant, and in that case, I just stock up on it when there’s a sale and a good coupon. 3. You can’t fall into the trap that if it’s on sale for a great deal, you should get it. I fell into that trap once, and that’s how I ended up with a ton of Target brand ibuprofen. 4. You will definitely have to do your shopping at more than one store, and most likely, you’ll have to go shopping weekly. I regularly visit three. 5. You can’t plan out a week of meals and then shop for them. Instead, I do the reverse and plan our meals based on what we already have and what’s on sale that week. However, if you plan ahead for when you’re having a party, you can usually most of what you need for a bargain. For the BBQ we just had, I got deals on the buns, brats, hot dogs, chips, peaches, corn, and whole milk (for ice cream). 6. You may need room for your stockpile reserve. Since I buy things as they are on sale and not as I need them, we do have quite a bit of some items right now. We’re totally set on body wash and salad dressing, for example. We have some room to keep these items, but space is a concern. No way I’m living like one Extreme Coupon woman who has a whole utility rack full or canned goods in her bedroom and paper towel under her kids’ beds! 7. Set your savings realistically. You’re not going to buy four carts of groceries for $10. I try to go by the rule that if I saved as much as I spent, it was a successful trip. I wish I had been keeping track of my savings since I started couponing, but I wasn’t thinking about it. I’ll try to track my savings for the month of July and report back. I really hope this helps all those couponing newbies out there. If you have any questions, fire them off in the comments and I will answer them all. Happy shopping! Thanks, Erin. I’m happy to help if you have any couponing questions. Plus, it’s fun to compare notes on how much we saved. I’m serious about starting a running tally of my savings for the month of July.